This day, 9 Ajaw (October 22) marks the tsolk’in anniversary of the launch of our new MAM web site and blog, which occurred on the previous 9 Ajaw (February 5). With this issue we complete our coverage of the historic Congreso de Epigrafistas Mayas by publishing, appropriately, a hearfelt and beautifully rendered thank-you card from a great Maya scribe and artist, congreso participant Walter Amilcar Paz Joj, Maya Kaqchikel from Panajachel, or as he writes it Pan Ajache’l. 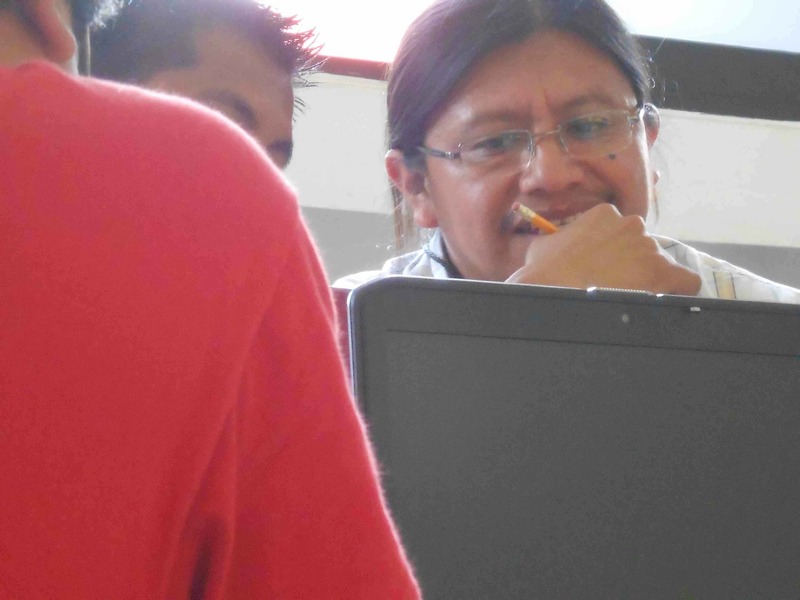 During our next tsolk’in we will be reporting on events that have occurred since the congreso, where our colleagues are applying their knowledge of the glyphs in their home communities. Dear Bruce Love, I hereby send you a heartfelt greeting, wishing you success in your work. 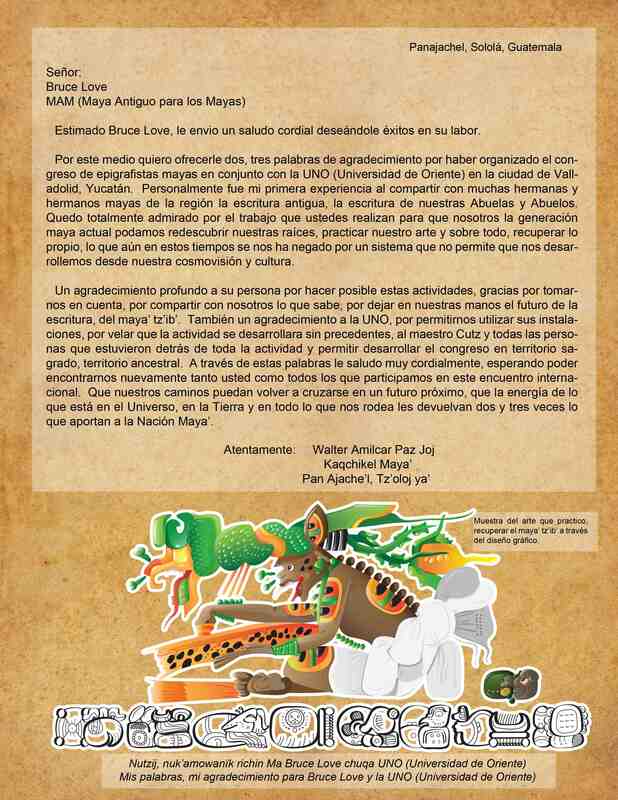 Through this letter, I want to offer you a few words to express my gratitude for having organized the Maya Epigraphers Conference, together with UNO (Universidad de Oriente), in the city of Valladolid, Yucatán. For me, it was the first time I got to share the ancient writing, the writing of our Grandmothers and Grandfathers, with many Maya sisters and brothers of the region. I am completely in awe of the work you do so that we, the current Maya generation, may re-discover our roots, practice our art and, above all, recover what is ours; that which, even today, is denied to us by a system that prevents us from developing our own world vision and culture. I deeply thank you personally for making these activities possible, I thank you for thinking of us, for sharing with us what you know, for putting in our hands the future of writing, the future of Maya tz’ib. I also take this opportunity to thank UNO for lending us its facilities, for making sure these unprecedented activities could be carried out; I thank teacher Cruz and all the people who were behind these activities, for allowing the Conference to take place on sacred, ancestral territory. Through these words, I greet you with affection, hoping to meet again with you and with all those who took part in this international meeting. May our paths cross again very soon, and may the energy of the Universe, of the Earth and of everything that surrounds us give back to you twice or thrice as much as you give the Maya nation.